The Ligue féminine de basketball is the only professional league for women playing basketball in France. After the financial problems of clubs in the last two seasons, many clubs were asked to cut costs for the coming season so as to reduce overheads. As a result of the demands by the French Basketball Federation, the transfer period in France was not as hectic as in past seasons. As in previous years we review the LFB rosters of the 14 teams in two parts with the teams appearing in alphabetic order. The second part of the women playing basketball team roster review can be located by clicking this link. For 2009-2010 Aix-en-Provence has a new look with only Anaïs Deas (left) returning from last season’s professional roster. She is only 22 years old but will captain the team. The new team Aix-en-Provence for 2009-2010 was officially announced last May soon after Aix had been eliminated from the LFB challenge round. The only addition to the team is Sabrina Palie who comes in as medical cover for Claire Tomasezwski who is not expected to return to the basketball court some time in October. Aix' pre-season preparation was hampered by cancellations. But a (73-71) victory against Montpellier put them in good shape for the season opener against Nantes-Rezé. The LFB team roster is: Anaïs Déas, Anaïs Viale, Claudinha das Neves, Claire Tomasezwski, Isabelle Strunc, Ivona Matic, Margaux Okou Zouzouo, Julie Page, Guiday Mendy, Tiffany Stansbury. The head coach is Emmanuel Coeuret. Armentières prided itself with a roster made up of 90% from the northern region of France. However this will not be the case for the coming season. Last year the head coach Stéphane Lalart set the objective as NF1 survival. He was without key players who were on maternity leave. However the club did much better than expected and went on to win the NF1 final four after finishing second during the regular season. For the coming season the club have had to go out of their region to bring in five new players. Cora Duval and Frédérique Ayissi (right), who will captain the team, joined from NF1 regular season's winners Limoges ABC. 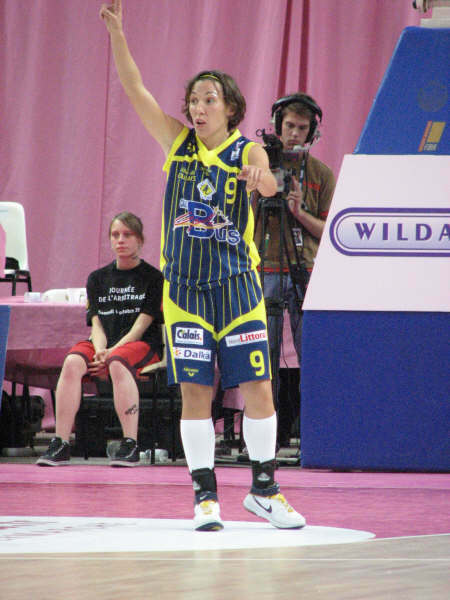 Ayissi played in the LFB before and is joined by another player with LFB experience Valérie Labbe from Clermont Ferrand. Mélissa Micalletto and Anda Nedovic are the two other new players. The club has the lowest budget in the LFB and have had a difficult pre-season with no victories. The LFB team roster is: Virginie Brémont, Gaëtane Merlot, Maïwenn Catrix, Anne-Charlotte Quicque, Kateryna Pilyashenko-Novokhatna, Mélissa Micaletto, Valérie Labbé, Cora Duval, Marie-Frédérique Ayissi and Anna Nedovic. The head coach is Stéphane Lalart. Arras have managed to keep the core of its last season's team. Sarah Michel (left) asked to be released from the France U20 team last summer so that she would be ready for the start of the season. She was injured during the summer of 2008 while playing for France and missed most of that year recovering. She was also in the news when she agreed to sign for Arras while still under contract with Union Hainaut Basket and only on loan to Arras for a year. The other newcomers are Johanne Gomis who is fully recovered from the injury that cut short her season with Challes-les-Eaux in 2008. Gomis spent last season with Nice in NF1 working her way back to fitness. Olesia Malashenko is a Ukraine youth international that left her country at 16 to play in the Belgium league. 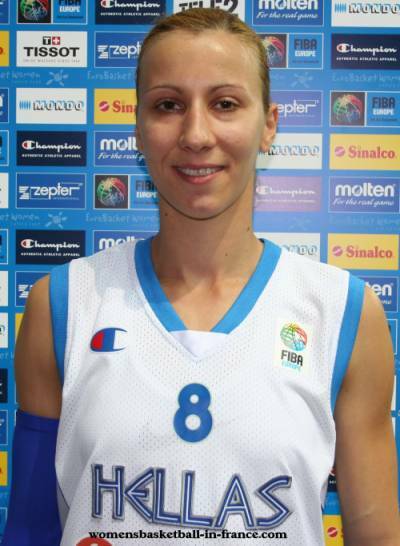 She played for Ukraine this summer for the first time and was at EuroBasket. She will be joined in France by her club team mate Pauline Akonga-Nsimbo. Hanna Bouldwin joins the growing number of Swedish players coming to France. Leilani Mitchell (right) is back for a second season in France while completing her second season with the New York Mystics. 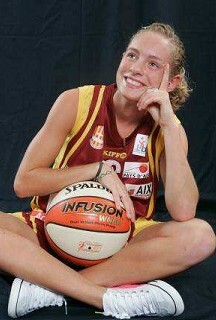 She will captain the side and make her first appearance at the Basket and the City. She missed out on the LFB last season because she was involved in the WNBA play-offs. Arras have had a reasonable pre-season with some impressive victories. They look set and ready to go for what may be their best season yet in the LFB. The LFB team roster is: Leilani Mitchell, Princesse Goubo, Julie Bertin, Sarah Michel, Marielle Amant, Johanne Gomis Hanna Bouldwin-Biernacka, Olesia Malashenko and Pauline Akonga-Nsimbo. The head coach is Bruno Blier. Céline Dumerc and Cathy Melain may have gone but the club still has a very balanced roster. Ilona Burgrova who is from the Czech Republic and a former youth international will be looking to make an impact in the LFB. They still speak about her blocks in South Carolina, where she played NCAA basketball for four years. There is Styliani Kaltsidou (left) who played for Greece during Euro Basket. She will be joined by Anaël Lardy, Jennifer Digbeu and Paoline Salagnac. In addition Margaux Galliou (16) moves up from the Bourges Basket Academy. Bourges have had some close matches at the Open LFB but remain unbeaten on the opening day. They have had a perfect pre-season with no defeats. So Pierre Vincent and Bourges Basket will start the season as favourites for title. The LFB roster is: Katarina Manic, Ana Lelas, Nwal-Endéné Miyem, Emméline Ndongue, Margaux Galliou, Ilona Burgrova, Styliani Kaltsidou, Anaël Lardy, Jennifer Digbeu and Paoline Salagnac. The head coach is Pierre Vincent. Cyril Sicsic had a great season last year with COB Calais and is hoping to repeat this again for 2009-2010. Like many clubs in the LFB Calais must watch its budget and as a result has reduced its professional roster to seven players. Aurélie Cibert (right) will captain the team and Lauren Neaves is back for her third season. Joyce Cousseins-Smith and Anne-Sophie Pagnier are also back. 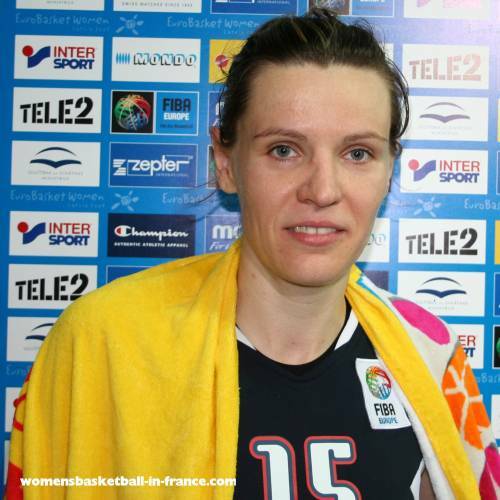 Calais have managed to sign Jennifer Humphrey who made an impact during her short stay at Basket Landes. Elisabeth Egnell makes her first trip outside Sweden and Iva Roglic comes from the famous basketball institution in Serbia, the Red Star. Calais have managed to pick up youth international Elisa Martins from Bourges and Kelly Corre from Mondeville to complete their roster. This is Sicsic's fifth season in charge. The pre-season results are no different from previous years with a series of wins and defeats. Calais are not likely to be title contenders but a place in Europe next season is not beyond them. The LFB roster is: Aurélie Cibert, Lauren Neaves, Joyce Cousseins-Smith, Anne-Sophie Pagnier, Jennifer Humphrey, Elisabeth Egnell, Iva Roglic, Elisa Martins and Kelly Corre. The head coach is Cyril Sicsic. Challes-les-Eaux was in the news at the end of last season because of the way they parted company with their long-time head coach Corinne Bénintendi. The club had more or less put the roster for for 2009-2010 in May. It came as no surprise when Emilie Duvivier and Mélanie Arnaud decided to leave the club as Challes had already announced that two players under contract would be allowed to leave. Marie Ruzickova who played at EuroBasket alongside Martina Luptakova-Gyurci (left) for the Slovak Republic and Elina Babkina from Latvia. 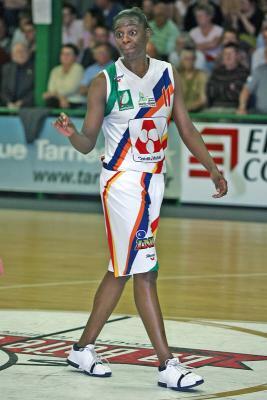 Babkina was not in the EuroBasket Women squad but played in the 2008 Olympic Games. The new coach Aldo Corno will not have an easy transition as the expectation at the club is high. In addition he will need to find the right balance because the bulk of his squad are point guards and pivots. The LFB roster is: Kirby Copeland, Martina Luptakova-Gyurci, Stéphanie Dubois, Laina Badiane, Silvia Bedu-Janostinova, Aida Fall, Elina Babkina, Kristen Brooke Sharp, Magali Lacroix and Marie Ruzickova. The head coach is Aldo Corno. Basket Landes' roster for this season was already in place in June. The only addition to the list is Amélie Pochet. Marion Laborde (left) is currently injured and is not to be expected back until January. She picked up a knee injury while playing for her university at the end of last season. The club appears to be better prepared for the LFB than last season. With the addition of solid shooters from beyond the arc, they could be the surprise of the season. The LFB roster is: Ekaterina Dimotrova, Bineta Diof, Marion Laborde, Anaïs Le Gluher, Anne Perovic, Amélie Pochet, Julie Barennes, Aminata Konate and Sabrina Reghaissïa. The head coach is Olivier Lafarque.